See what Thousands of People Witness Every Halloween! One Of The Scariest Home Haunts In America! 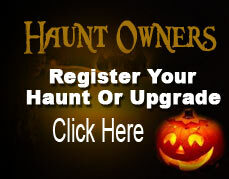 Visit the Scariest Home Haunt on Long Island! T IS AN OUTSIDE YARD HAUNT FOR TRICK OR TREATERS AND EVERYONE WHO LOVES HALLOWEEN. For 2018, the walk-through is newly designed to be tighter and much more claustrophobic! I've upped the ante again with some new and fresh ideas, but kept the classics that everyone loves. The details are going to blow you away on Halloween Night! And If you've seen the New Conjuring Horror movie called, The Nun, then you're going to love what I've got in store for you this Halloween! They'll be some great new props, rooms and actors this go around!! Looking forward to seeing everyone again this year because this is going to be one of the Haunts I've ever created!! Wednesday, October 31st Halloween Night Only!